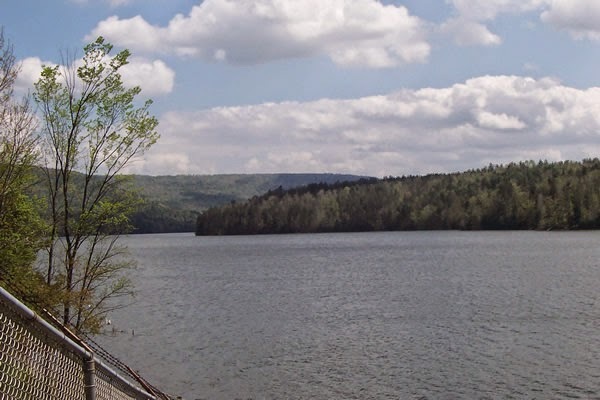 The New York City Department of Environmental Protection is investigating the cause of an oily sheen that was discovered in the Schoharie Reservoir on Monday afternoon. According to a press release issued this morning, the sheen was located several hundred feet down shore from the intake, but was successfully prevented from leaving the reservoir by water safety operators shutting down the intake chamber and installing an absorbent boom around the intake structure. A Watershed Post story on the oily spill quoted DEP spokesman Adam Bosch as saying the sheen was approximately fifty feet wide and about nine hundred feet long. As of Tuesday morning the sheen had dissipated and was no longer visible in the Schoharie Reservoir, which stores up to 19.6 billion gallons of water that is collected from a 314-mile watershed and diverted to New York City through a series of tunnels, creeks, and reservoirs. Although the official cause is still unknown, Hurricane Irene is at least partially responsible: "A preliminary investigation found that the sheen was likely coming from a previously undiscovered tank that was washed into Schoharie Reservoir in 2011 by Hurricane Irene." Blaming shifting ice and low water levels for dislodging the tank, DEP officials will continue to monitor the Reservoir for additional sheens, as well as develop plans to remove the tank once the ice melts and and its location is pinpointed.